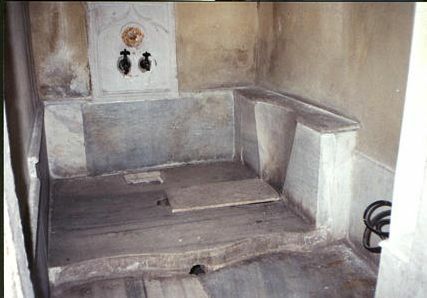 The first picture here shows the toilet of the Padishah Emperor, the Sultan of the Ottoman Empire, the ruler of all the Middle East, northern Africa, and south-east Europe. The Ottoman Empire was founded in 1299 in northwestern Anatolia, and survived until 1923. At its greatest extent in 1683 the Ottoman Empire controlled almost all of the African coast of the Mediterranean Sea, both shores of the Red Sea, southeastern Europe including the Balkans and much of today's Bulgaria and Romania, today's Turkey and Iraq, and the Levant. This imperial toilet is in the harem, the private quarters of the sultan, in Topkapı Palace in İstanbul, Turkey. There's a board over the hole, but you can still appreciate the fine marble and Sultan-level craftsmanship. Topkapı Palace was the official and primary residence of the Ottoman Sultans from 1465 through 1853. At its peak it was home to 4,000 people. I have a page with much more about İstanbul, Turkey. The large stone toilets leaned against this wall are representative of mid to late Ottoman Empire design. They show the Ottoman tendancy to include ornate design details in the most utilitarian of objects. 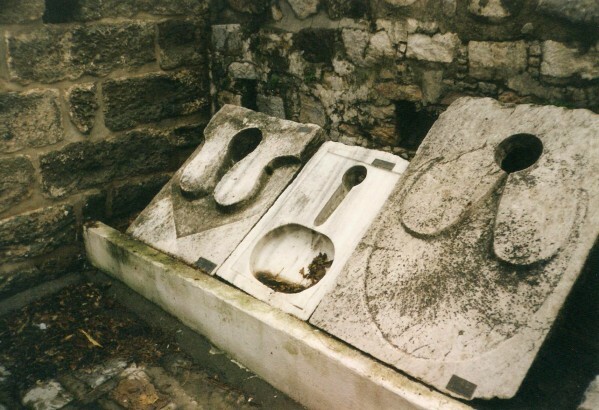 These toilets are on exhibit at the Museum of Underwater Archaeology, in Bodrum, Turkey. Also see the Crusader toilets for more toilets in Bodrum.